The pattern is in the Cherished Teddies book # 100, "Birthdays," from Designs by Gloria & Pat, Inc. 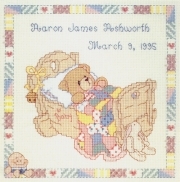 The pattern displays a baby bear in a cradle, with a blanket covering the bear, with a border surrounding the entire pattern. Note: This pattern includes a complete alphabet allowing you to personalize the design! With Supplies: $33.47 You download the design. We will send you, 31 skeins of DMC Floss & Wichelt 14ct. 18" x 21" Aida (Ivory) to complete your project.